Over-the-top pay TV revenue from services like Netflix and Hulu Plus is expected to nearly double in the next four years. Campbell, Calif.-based Infonetics Research estimates that revenue from OTT services will hit $5.8 billion this year and will rise to $10 billion in 2018. “These providers continue to challenge traditional pay-TV providers and are in the early stages of siphoning off revenue," states Jeff Heynen, principal analyst for broadband access and pay TV at Infonetics Research. OTT is still a fraction of the global pay-TV market, which totaled $117 billion in the first half of 2014. This was an increase of 3.9% from the first six months of 2013. Global pay-TV subscribers were up 10% to 837 million in the first six months of the year with the strongest growth again coming from telco companies. In the U.S. -- other than the telcos -- top traditional pay TV providers have lost 150,000 in the third quarter, according to other research. Still, cable, satellite and telco pay-TV service revenue continue to grow, driven by new worldwide subscribers and increased average revenue per user in North America and Western Europe, according to Infonetics. According to the study, however, higher TV and content costs continue to eat into business profitability. 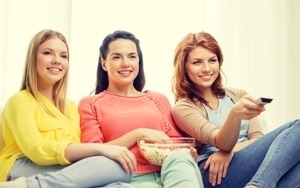 "Three Girls Watching TV" photo from Shutterstock.